ISTANBUL –U.S. 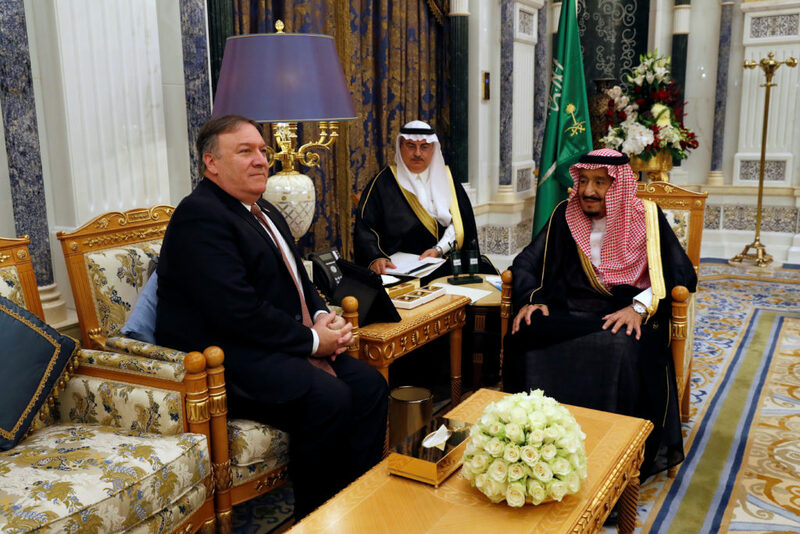 Secretary of State Mike Pompeo met on Tuesday with Saudi Arabia's King Salman over the disappearance and alleged slaying of Saudi writer Jamal Khashoggi, who vanished two weeks ago during a visit to the Saudi Consulate in Istanbul. Pompeo's arrival came hours after a Turkish forensics team finished a search inside the consulate. Police planned a second search, this one of the Saudi consul's home in Istanbul, a Turkish Foreign Ministry official said. Turkish officials say they fear Khashoggi was killed and dismembered inside the Istanbul consulate. Saudi officials previously have called the allegations "baseless," but reports in U.S. media on Tuesday suggested the kingdom may acknowledge the writer was killed there. Pompeo landed in Riyadh on Tuesday morning and was welcomed by Saudi Foreign Minister Adel al-Jubeir on landing. He didn't make any remarks to the media. Soon after, Pompeo arrived at a royal palace, where King Salman greeted him. America's top diplomat thanked the king "for accepting my visit on behalf of President (Donald) Trump" before going into a closed-door meeting. Trump had dispatched Pompeo to speak to the monarch of the world's top oil exporter over Khashoggi's disappearance. Trump, after speaking on Monday with King Salman, said without offering evidence that the slaying could have been carried out by "rogue killers." That potentially offers the U.S.-allied kingdom a possible path out of a global diplomatic firestorm. However, left unsaid was the fact that any decision in the ultraconservative kingdom rests solely with the ruling Al Saud family. Pompeo also was to meet with Saudi Crown Prince Mohammed bin Salman, whom Khashoggi wrote critically about for The Washington Post and whose rise to power prompted the writer to go into a self-imposed exile in the United States. Saudi officials have been in and out of the building since Khashoggi's disappearance Oct. 2 without being stopped. Under the Vienna Convention, diplomatic posts are technically foreign soil that must be protected and respected by host countries. What evidence Turkish officials gathered at the consulate remains unknown, though Erdogan told journalists on Tuesday that police sought traces of "toxic materials," without elaborating. Turkey's private DHA news agency said the Saudi consul's office was among the rooms searched. On Tuesday, a Turkish Foreign Ministry official acknowledged police want to search the Saudi consul's home as well. Surveillance footage previously leaked in Turkish media shows vehicles moving between the consulate and the consul's home immediately after Khashoggi's disappearance. Prince Mohammed has aggressively pitched the kingdom as a destination for foreign investment. But Khashoggi's disappearance has led several business leaders and media outlets to back out of the upcoming investment conference in Riyadh, called the Future Investment Initiative. Trump previously warned of "severe punishment" for the kingdom if it was found to be involved in Khashoggi's disappearance, which has spooked investors in Saudi Arabia and SoftBank, a Japanese firm that manages tens of billions of dollars for the kingdom. Trump's warning drew an angry response Sunday from Saudi Arabia and its state-linked media, including a suggestion that Riyadh could wield its oil production as a weapon. The U.S. president has been after King Salman and OPEC to boost production for weeks to drive down high crude oil prices, caused in part by the coming re-imposition of oil sanctions on Iran after the U.S. withdrawal from that's country's nuclear deal with world powers.